One of our earliest plans for the land was a lake. It took a few years to get the permission and funds together, and to choose a good team to make it, but in summer of 2017 our first dam was built. Now as I write in 2019 we have this lake built, plus a second smaller one in the adjacent valley that we made last summer. As you can see from the image below, this lake is located in the centre of property, a heart-shaped body of water introduced into the heart of the land that nourishes the land and nurtures its inhabitants. The dam collects water from two water lines and a large area of hillside. This hillside is very eroded with very poor soil and sparse vegetation. By retaining the water in this area it prevents it all running off further down the valley. Over time, this will help create a more moist environment in this area and will accelerate the regeneration of these slopes and allow for planting of more trees. The design for the lake includes a circulation system with a solar pump. When the sun shines, water will be pumped to a pond higher up the slope, from where it can run back down the slope to the lake as a small stream, oxygenating the water and helping to keep it clean. Even though the lake has still not filled to the top, we have started planting native water-loving plants around the lake edges which will also help clean the water with their root systems. Since making this lake, we not longer have to cope with our annual water crisis. We can use it for irrigation in the summer, enabling us to increase our production of fruit and vegetables. During dry years we will not need to fear if the wells run dry, as we can also purify the water from the lake for our domestic use. It will also provide a habitat for aquatic plants and animals, and provide a source of drinking water for birds and animals, increasing the biodiversity of the area. The increase in humidity created by the lake and the vegetation planted around it, will take the edge of the heat and dryness of the long summers, and so reduce the risk of fire. The lake also provides a supply of water for combating fire. Last but not least, the dam provides us with a place for swimming and recreation in the hot summers, and and will increase the beauty of the land for our sensory enjoyment. It has been a very dry summer. Our drinking water well was very low, and we have been on a very low water usage policy since the end of July. There were several fires in the area over the summer. Water security has become our number one priority. We have been unable to go ahead and build the dam this year due to the planning approval taking a really long time, and lack of funds. So our priority for the coming year is to raise funds for a complete water retention project that we can build in Autumn 2016. We now plan to build two dams, the one in the picture above, and another one below it on the main water line, which has a much bigger catchment area. We will also build a large water storage tank at the top of the property. We will use solar pumps to pump water from the bottom lake to the upper lake and then up to the water tank. With this system we will be able to capture much more of the winter rains, and will have an abundance of water for all our needs over the summer. From the top water tank we will be able to irrigate anywhere on the land, allowing for a much higher survival rate for planted saplings, and so accelerating our forest regeneration plans. We will also implement a network of fire hoses and sprinklers to offer potentially life-saving protection in the event of a fire. Clare wrote a blog about our lack of water…..
We have now been granted permission to build the first lake and work has already started preparing the area by moving olive trees to a new location. 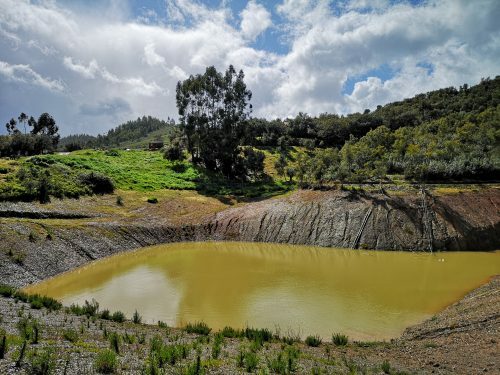 Work on the dam excavation will begin soon…..
We are also building a 25,000 litres ferrocement tank on the hilltop and work has already started to prepare the site. The tank will be completed in early March and will be connected to the fire protection and emergency water system. We are happy that this summer we will already be in a much better situation with water than the previous two summers. The dam is complete! Delays from the construction team meant that the job was postponed until August, and then it took about 4 weeks to carry out the work. Although the dust and noise was sometimes a challenge, they did a great job, and now we have a very large hole waiting to be filled by the rain (which is yet to arrive). We still have some final pieces to complete such as the overflow channel, and landscaping around the perimeter. We also kept some piles of good clay for building, and topsoil which will be used in tree-planting holes around the edge of the lake, and for creating terraces in the area between the lake and the main house which will become an aromatic and medicinal healing garden.